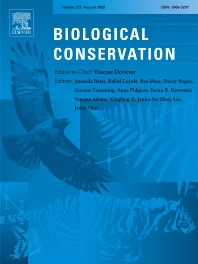 Biological Conservation is a leading international journal in the discipline of conservation science. The journal publishes articles spanning a diverse range of fields that contribute to the biological, sociological, ethical and economic dimensions of conservation. The primary aim of Biological Conservation is the publication of high-quality papers that advance the science and practice of conservation, or which demonstrate the application of conservation principles and policy. Biological Conservation invites the submission of research articles, reviews (including systematic reviews and perspectives), short communications, policy perspectives, and letters to the editor dealing with all aspects of conservation science, including theoretical and empirical investigations into the consequences of human actions for the diversity, structure and function of terrestrial, aquatic or marine ecosystems. Such papers may include quantitative assessments of extinction risk, fragmentation effects, spread of invasive organisms, conservation genetics, conservation management, global change effects on biodiversity, landscape or reserve design and management, restoration ecology, or resource economics. We also welcome papers coming from social sciences including those reporting on advances in conservation politics, ethics, policy, human social structure and biodiversity, and political culture among other subjects. Biological Conservation covers interdisciplinary topics within conservation biology and also provides practical applications of conservation research for land/resource managers and policy makers. We publish articles and thematic special issues that have a global relevance in terms of the topics or issues addressed, and thus demonstrate applications of conservation science and management beyond the specific system or species studied. Biological Conservation is an affiliate publication of the Society for Conservation Biology (SCB). SCB members can obtain a personal subscription to this journal through the Society.